U2 ZeroCarbon research and innovation initiative leverages world class expertise from multidisciplinary approaches and the wealth of knowledge provided by its participants in sustainable design, energy, food production and waste, decision support software and community engagement. 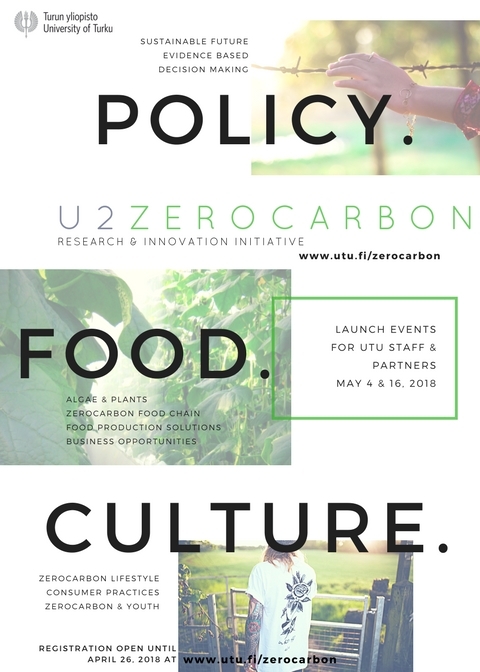 U2 Zero Carbon research focuses on agriculture and food chain, and on consumers’ role – both of these are the core areas of the Biofuture profiling area of the University of Turku (UTU). Working within an interdisciplinary framework, the U2 Zero Carbon brings together researchers working also in psychology, sociology, political science, economics and other social sciences from real-life projects by exploring how to overcome Zero Carbon barriers in innovative ways. University of Turku is a member of the Climate Leadership Coalition (CLC), an important U2 Zero Carbon strategic partner, which aims at enhancing the Finnish businesses’ and research organisations’ competitiveness and improve their ability to utilize the business opportunities related to climate change. U2 Zero Carbon collaborates also with other private partners for sequestering carbon in agriculture, forests and natural ecosystems and developing healthy eating habits while promoting sustainable use of natural resources. The initiative will build upon its expertise in sustainable design, energy, food production and waste, decision support software and community engagement. Zero Carbon and related digitalization are main mega trends ​for building more sustainable future! Learning from real life projects, the U2 Zero Carbon Initiative is divided in three Impact Pathways reflecting the three pivotal “bridges” that must be crossed in order to deliver a zero carbon future:​ Zero Carbon agriculture and food chain, Zero Carbon consumers, and Evidence-based Zero Carbon policy. Please find the invitation and event programs in printable file format here. Register HERE. Registration is open until May 13, 2018. Ready to talk to U2ZC experts? ​Share UTU Zero Carbon + CLC Research & Innovation.